This product is suitable for MR16 lamp cup, halogen lamp, Disco Lights, LED lamp cup, a common grille searchlights, beans gall lights, ceiling, low-voltage lights and so on. REPLACEMENT DICHROIC LAMP GX5.3 BASE, WITH WHITE LEAD- LA00290 - (Qty 1) OFTEN USED IN CEILING FITTINGS & DISCO LIGHTS. 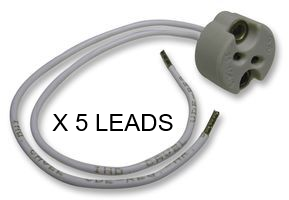 REPLACEMENT DICHROIC LAMP GX5.3 BASES, WITH WHITE LEAD- LA00290 - (Qty 5) OFTEN USED IN CEILING FITTINGS & DISCO LIGHTS.